The view from my office desk is one of mountains with snow covered trees. It's still snowing gently and has no sign of letting up. It is a calming and peaceful scene. Then, I turn around and from my desk chair look out over the rest of my office. There is an unpacked suitcase that has been sitting there since our return from the Family Travel Conference. I have an organized, yet large, work area for taxes that I wish would somehow go away. There are books on the bench seat by the other window in my office and various other projects around the room that are patiently waiting for my attention. My 20 year old stops in during his lunch break from work. We catch up on how things are going for him and then I tell him that I wish I had a magic wand that I could just wave around and make all of this disappear. He just laughs and tells me I do have a magic wand - "Here!" 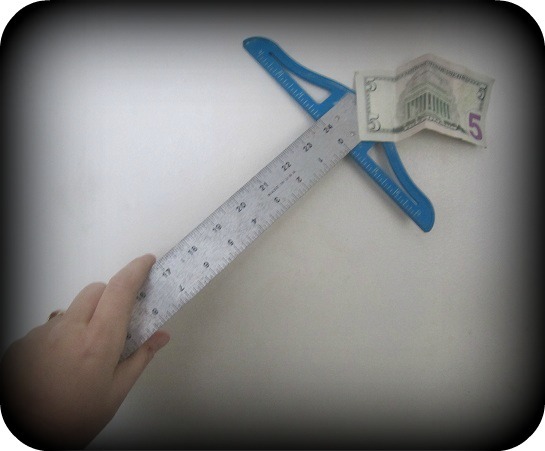 he says as he grabs my long ruler off the wall and takes some scotch tape and tapes a $5 bill to the end. "Just walk through the house waving your magic wand and you will find someone who will be happy to help you make this stuff go away".